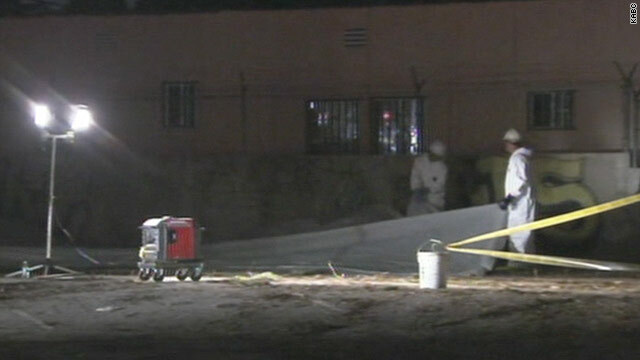 Workers inspect the scene in Southern California where a man was electrocuted. Read more about this story from CNN affiliate KABC. (CNN) -- One man was electrocuted and his female partner was severely burned after the couple attempted to steal copper wire from a vacant property in Southern California, police said. "I believe they thought the power was off," said Lt. Keith Hupp of the South Gate Police Department. "It was a pretty ugly scene," he added. A witness said he rushed to the site after hearing an explosion. "I just heard a loud explosion and a lady screaming, just screaming like crazy, so I walked over there and I seen her like half burned, and she was just like crying, asking for help for her husband," Jose Carrasco told CNN affiliate KABC. Police said they believe they found the couple's children -- ages 3 and 6 -- waiting in a truck near the vacant property when they arrived at the scene Saturday afternoon. The woman was being treated for severe burn injuries and listed in critical condition Saturday night, Hupp said, and the children were in the custody of protective services. Police have not released the names of the victims pending notification of next of kin.